I’ve been useless again this weekend as far as getting anything done in writing. I was watching a video (Girl by the Ocean by ThePortraitArt on youtube) and stopped at 0:38 when I had inspiration. 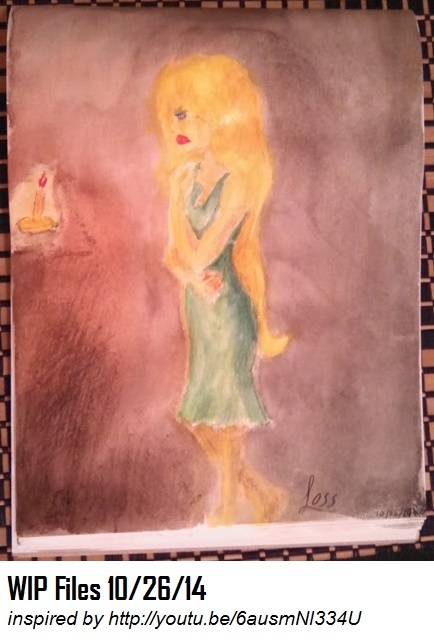 I wanted to draw Vivienne looking at a candle lit in Cedrick’s memory, with the darkness pooling in around her. I didn’t want to lose the idea so I did a lot of things wrong–used the wrong kind of paper, didn’t realize at first that the pencils I had were watercolor, had very limited color options so I accidentally made her skin too close to the color of her hair, made her lips bleed out, couldn’t decide on an angle for the table so I let it just disappear, plus her proportions are all wonky– but that’s what WIP Files are for, right? Not care about all the things wrong and just DO something. So, here’s Vivienne, mourning her loss. The songs that were in my head while drawing it were Safe & Sound by Taylor Swift, and Castle Walls by Christina Aguilera.